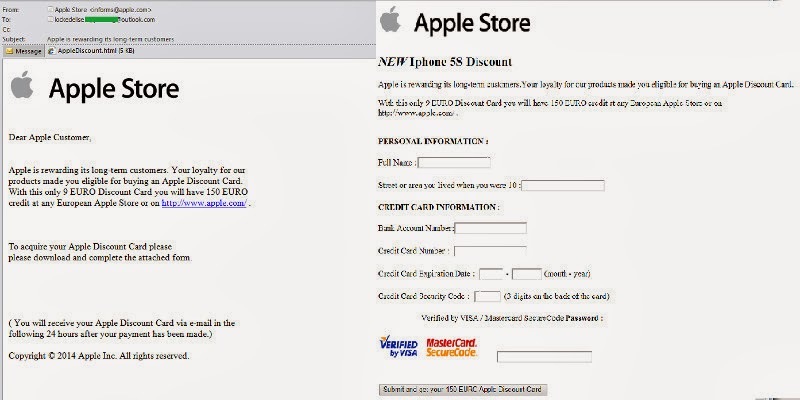 A new phishing campaign targeting European users of Apple store which promises to offer a discount. Security researchers at Kaspersky have spotted a new spam mail targeting Apple users, tricks users into thinking that they can get discounts of 150 euros by just paying 9 euros. "Apple is rewarding its long-term customers. Your loyalty for our products made you eligible for buying an Apple discount card" The spam mail reads. The spam mail asks users to download an attached HTML file and fill the form, where users are being asked to enter personal information as well as credit card information. The scammers spoofed the email address such that it makes the email pretending to be from informs@apple.com. They also promised to send the discount card within 24 hours, after filling the form. If a recipient follows the instructions and fill the form, the phishing file will send the data to the attacker server. The attacker will use the given financial data.